A certain vocal homeopathy proponent—who shall remain unnamed (and I have taken care to block their name and Twitter ID from the screenshots as well)—made two posts extolling the virtues of some homeopathic nostrum named… wait for it… “Berlin Wall” or “Murus Berlinensis”. The following set of screenshots makes clear what it entails. Two posts on “Berlin Wall”, dated Feb 5 and 6, 2018, from a vocal homeopathy proponent on Twitter; click to embiggen the screenshots. Needless to say, I found it difficult to believe my eyes. And yet, none of the two websites mentioned in the tweets above seemed to be satire websites. 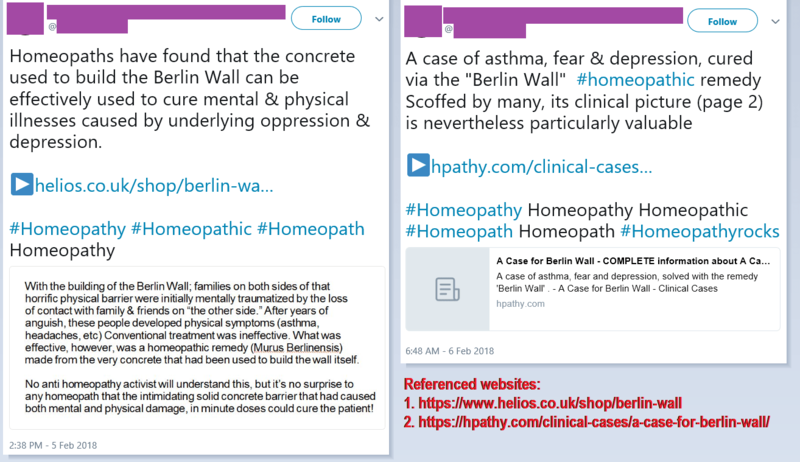 One of the referenced websites, Helios Homeopathy, a UK-based company, appears to sell the ‘remedy’ named “Berlin Wall”—even though at their website, the description is only of the Berlin Wall, with a mention that it was made of concrete, but nothing about the actual item and its provenance. However, from the page, one can buy the item in various formulations, sizes, as well as homeopathic potencies. I tried out a random combination of formulation, size and homeopathic potency: 1 Liter of an Oral liquid (23% alcohol) at 50M potency would set you back by a cool £66.65 (before taxes I think). Just as a reference point, the potency ’50M’ refers to “50 Millesimal”, also alternatively referred to as ‘Q’ potency (for ‘quinquagintamilia’, Latin for 50,000) or ‘LM’ potency—all referring to a dilution of 1 volume in 50,000 volumes. Sounds plausible, right? Now consider, this store sells some of the ‘remedy’ liquids at a potency of LM85. Which is essentially a dilution of 1 volume of a liquid in 2.5E+399 volumes—you read that right, 2.5 x 10^399, to the order of 398 zeroes after ten. For comparison, ONE MOLE of any substance contains 6.02E+23 or 6.02 x 10^23 units (atoms or molecules), merely the order of 22 zeroes after ten, known as Avogadro’s Number. Therefore, if any substance is diluted ten-fold serially—1 part of substance goes in 9 parts of solvent, making a 1:10 dilution; 1 part of the diluted substance goes in 9 parts of solvent, making a 1:100 dilution; and so forth—at the 24th dilution (what would be roughly equivalent in homeopathy to 24X or 12C or LM6/Q06), the statistical probability of finding even 1 unit of the original substance becomes nil. Therefore, at any of the further ‘higher potencies’, it is physicochemically impossible to have any trace of the original substance, leaving only the solvent or diluent. Of course, English scientist John Dalton published his Atomic Theory in 1808; Italian scientist Amadeo Avogadro proposed his law in 1811, which was adopted into circulation in late 1850s after another Italian scientist, Stanislao Cannizzaro, fit then-available empirical evidence to the theoretical structure provided by Avogadro’s law; suffice it to say, Samuel Hahnemann had no clue about atoms and molecules, or scientific empiricism, when he created his system of homeopathy in 1796. The other link mentioned in the graphic above points to a post in a homeopathy e-magazine named ‘Hpathy’. In this post, a clinical case is described, in which asthma, fear and depression in a woman was apparently ‘solved’ with ‘Berlin Wall’. This, of course, is nothing like a Case Report that we are used to reading in Medical Journals. This is a lengthy anecdote of a homeopath’s impression of what might have been a patient’s illness—except in paragraph after paragraph, you end up feeling extremely sad for the patient, because she needed proper treatment from a qualified mental health professional, as well as perhaps a competent Pulmonologist, but she was stuck with this quack, who gave her what was essentially the washing of a fragment of the Berlin Wall concrete, and promptly claimed credit whenever the waning phase of the poor woman’s psychological symptoms (waxing and waning of symptoms are well known in psychopathological disorders) set in. And therein lies one aspect of quackery, which is often ignored by those who consider themselves quackery-agnostic and ask, “What’s the harm?” This is the harm, when dependence upon an ineffectual, pseudoscientific quackery prevents a vulnerable patient from seeking and accessing proper medical care. The fun on Twitter didn’t end there. Steve Tonkin, a retired science/maths teacher and veteran debunker of all modalities of pseudoscience put up another glorious example. Going down that rabbit hole, I discovered two additional homeopathic ‘remedies’, Magnetis polus arcticus (North Pole of the Magnet) and Magnetis polus australis (South Pole of the Magnet)—these are, respectively, water or lactose (milk sugar; pretentiously referred to as ‘saccharum lactis’ by homeopaths) globules “charged with the influence of the North or the South pole—apparently prescribed for various ailments, from cough, to frost-bite, ingrown toe-nails, levitation (! ), Hernia, toothache, amenorrhea, and so forth. The search led to me to a rather entertaining study (PDF available at this link). Apparently, the Faculty of Health Sciences, University of Johannesburg, offers a Master’s Degree in Technology in Homeopathy. For their dissertation, some enterprising student chose to compare the effects of two dilutions (30C, well beyond the 12C limit I mentioned above; and 2M, or one part in 2.5 trillion part of solvent, still a believable dilution per se) of Magnetis Polus Australis on Onychocryptosis, the fancy name for ingrown toe-nail. After a six-week double-blind placebo-controlled study with 40 subjects complaining of ingrown toe-nails, the intrepid researcher observed: (a) no significant difference in the symptoms behind experimental group (getting the homeopathic ‘remedy’) and the control group (getting the placebo liquid), and (b) the control group (getting placebo) had a significant improvement of pain. Nothing unexpected from a quack nostrum, but such meta-placebo in a comparison of placebos!! I tried to find how this ingenious remedy is actually made in real life, with scant success. Fortunately, this student’s thesis provided a valuable clue; and guess who makes it in the UK? Our friend mentioned above, Helios, of the Berlin Wall fame. After all these years, THIS has finally convinced me. One of these days, I really, really want to market the nostrum Arcus Crepitu Unicornis at LM85—ought to be a potent, broad spectrum, individualized anti-depressant following the Homeopathy Organon. I have been advised that while my “Arc. Crep” would be good in the EU as an unlicensed medicine, in order to capture the US market, I’d have to find a way to get it included in the Homœopathic Pharmacopoeia of the United States (HPUS). Sundry skeptics, no doubt jealous of my success, would point out that the name of the remedy loosely translates to Rainbow Fart of a Unicorn, but hey! it is surely going to be better than the Berlin Wall or the Magnetic Poles in helping me laugh all the way to the bank, n’est-ce pas? One of the referenced websites, Helios Homeopathy, a UK-based company, appears to sell the ‘remedy’ named “Berlin Wall”—even though at their website, the description is only of the Berlin Wall, with a mention that it was made of concrete, but nothing about the actual item and its provenance. This homeopathic product is neither registered nor authorised in the UK so it is essentially an unlicensed medicinal product. All they are permitted to do is give a price list of these products and are not permitted to say anything more about them – I’m not even sure whether giving the information that it’s made of concrete is permitted. Then there is the question of whether they are permitted to even sell the product to someone who has not had a face-to-face consultation on the pharmacy premises with the registered pharmacist, but they are probably permitted to sell it to someone abroad. That “permitted to sell” is the crux of the matter, innit? 🙂 But I do hope you like my discovery, homeopathic Arcus Crepitu Unicornis.